Last week, my students and I spoke with a writer who's been dead for almost two hundred years. Whoa – is Luther teaching clairvoyance now? Not exactly. 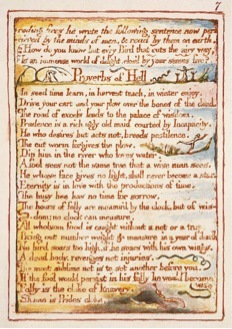 But in my advanced seminar for English majors, students are getting deeper into the mind of the English poet, engraver and radical visionary William Blake (1757-1827) by learning and practicing the same artistic methods he used to create his illuminated books – a method of engraving called relief etching. In this process, an artist draws on a copper plate with wax, then immerses the plate in an acid bath for several hours. Any areas of the plate not protected by the wax will be eaten away, raising the wax drawing or writing as a raised, three-dimensional metal surface. 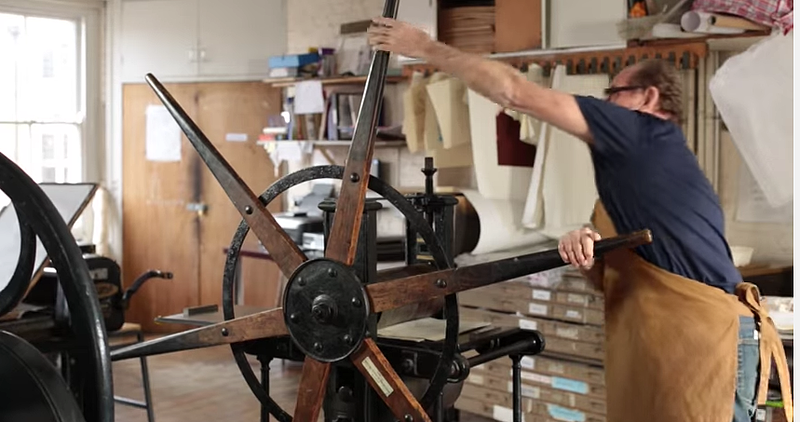 Then the artist can ink that raised surface, position the plate against paper and layers of protective blanketing in a large press, and turn its giant wheel – just like the wheel of a ship – to roll the whole thing underneath a large weight that will press the image onto a sheet of paper. Very, very cool. Here's the press in action in a wonderful short film on Blake's process from the British Library. It's hard to convey to those unfamiliar with Blake how intimately the etching and printing process itself is tied into his thought, and how well it functions literally and symbolically to convey his ideas about vision, imagination and the hard daily work of craft. A deeply but unconventionally Christian thinker who never earned more than a minimal living from his work–in every respect, Blake was a nonconformist–he wrote that "if the doors of perception were cleansed, every thing would appear to man as it is, infinite." Our habits of seeing and being–especially social mores that separate us from our true selves, our fellow humans, and the reality of God – must be continually reevaluated and changed in the process of what Blake calls "mental fight." Just as the artist struggles with his materials every day in order to bring his images to others, each person must struggle to see reality with freshness and clarity and to serve fellow humans (and non-humans) with justice and equity, because, in a phrase from Blake's letters that recurs in our discussions, "as a man is, so he sees." How you view the world and who you are and how you act construct one another, continually. 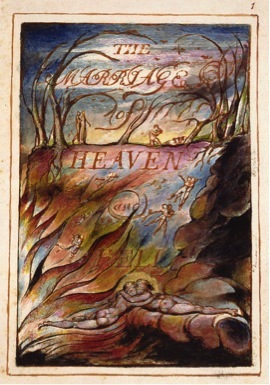 Therefore, "The Marriage of Heaven and Hell" (1790), although less well-known than, say, "Songs of Innocence" or "Songs of Experience" (source of the famous "Tyger, Tyger, burning bright"), is a great place to see the intertwining of Blake's ideas and his artistic method. Swooping from sarcasm to humor to deep seriousness to scorn, a first-person speaker leads us on "a Memorable Fancy"–an imaginary journey through Hell. Except that like Alice in Wonderland, we soon discover that in this world, everything is reversed, in a way that shakes us up to refresh our thinking, pushing our views of "religion" beyond the airless, pious cliches that thrived in late 18th-century London. In Blake's hell, angels are timid and prim; devils are curious and interesting. Desire is not a force of sin but a force of creative energy and truth. And a religion focused only on obedience to laws may be no religion at all, since "Jesus was all virtue, and acted from impulse, not from rules." Bouncing us between opposites, reversals and upside-down states, Blake asks us to ponder his statement that "without contraries is no progression" in the human mind or soul. "Attraction and Repulsion, Reason and Energy, Love and Hate, are necessary to Human existence," he writes. And without contraries, there is no progression for the reader across the page–because relief etching literally begins with a contrary, an opposite, a mirror image. Look at the printed page above. To make it come out "right" on paper, it had to be written backwards in wax on the copper plate to begin with. Called "mirror writing," this was an art of which Blake was an acknowledged master, even by other printers of his day. The symbolic dimensions of relief etching continue throughout the rest of the poem: words appear courtesy of "corroding fires" (the acid bath) which "in Hell are salutary and medicinal, melting apparent surfaces away, and displaying the infinite which was hid." Blake even describes a "printing house in hell" with six chambers that take readers through recognizable equivalents of the printing process, from cleaning the copper plate to "arrang[ing]" the finished books "in libraries." Given how thoroughly the method of his imagination's physical expression saturates his imagination itself, it's no surprise that he and his wife Catherine lived most of their life in one room dominated by the materials of work, particularly the giant press. And, significantly, a printer's assistant was known as a "devil"–which literally made Catherine, as one of my students laughingly pointed out, a she-devil. Therefore, reading William Blake, even studying the wonderful reproductions in the online Blake Archive, wouldn't be enough to take students and me as close to him as we wanted to be. 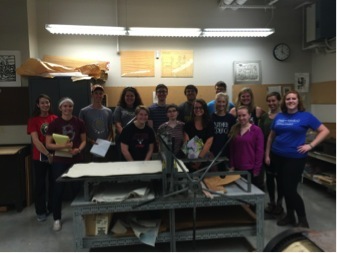 Accordingly, we were welcomed into the print studio last week by my colleague David Kamm from Luther's Visual and Performing Arts Department, along with an advanced printmaking student, who taught us the process start to finish. I'll never forget the thrill of holding a blank copper plate in my hands for the first time, the sound of the wet ink being applied to the plate, the feeling of gripping the wheel of the press–the kind of waking-up of the senses that means an artistic and intellectual awakening too. Working independently or in small groups, we'll be revisiting the studio throughout the semester to paint our designs in wax on the plates and etch and print them–a long process which is already helping us understand Blake's far-reaching, epic views of time. In my forthcoming book, "The Hands-On Life: How to Wake Yourself Up and Save The World," I argue that sensory connection to the physical world has tremendous artistic, spiritual and even political power, and I can see it every time I look at my students. On their faces, and in their writings and conversations, I see an understanding of Blake that goes deeper now, aided by hand as well as mind. The process of art, just like the work of art itself, speaks across time and space through the common language of the human body and the human senses, which we share with Michelangelo and Zora Neale Hurston and John Keats and Beethoven. Thinkers like Matthew Crawford, William Deresiewicz and others write convincingly that higher education mustn't separate hand from heart from head, must give a place to doing and making as well as thinking. William Blake, and we, could not agree more.